Hello out there, this is David calling from the Lava Tower. We have been climbing now for 4.5 days, this is our 5th day. 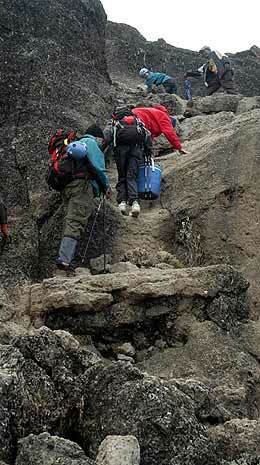 We’ve been going through luscious rain forest to moorland to alpine lunar landscape, from Shira plateau to Lava Tower. 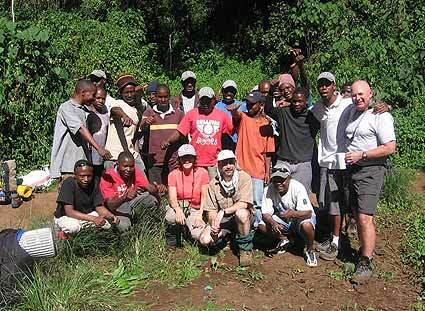 The guides and porters are super, we are having a great time. I’m working out a little stomach illness and headache but overall our spirits are good and we look forward to a rest day at Karanga Camp. Hello to my family. Hi there, this is Pat. Jambo to all my family and friends. I’m doing OK. I had a few days where I had similar issues that I had in Nepal but good ol’ Cipro worked it’s magic and I’m OK now. This is a pretty intimidating mountain but I think I am going to make it to the top. I think we are because we have a great staff. A special thank you to Safi, Rodrick and Eluise who is cooking great food for us. We are sorry that Papa Joe left us, we really miss him but he’s got a fan club up here. Hi this is Pat and I’m giving you my second dispatch for today. We are feeling really strong tonight. We climbed the Baranco wall today which is a rock face and I know I could not have done it without Rodrick carrying my pack for me. If I would have been carrying it I would have ended up in the ravine below. We are in Karanga valley right now and it’s absolutely gorgeous outside, the sky is crystal clear and you can see forever in the heavens. We can see the town of Moshi below and it’s absolutely spectacular. I just want to add one thing, we have the most incredible staff, Safi, Rodrick, all of them are just super and I know I could not do this if they were not here helping us. These guys are terrific, we are one family, one team on one mountain. Hi this is David, like Pat said we climbed up the Baranco wall, an impressive wall which twists and turns it’s way up. Pat was great. Rodrick lead a great pace up the mountain which really helps conserve your energy. It was fun and a great scramble. We beat the early afternoon rain when we got to the top. Now we are at the Karanga valley just relaxing and getting ready for tomorrow to move up higher on the mountain, bye for now.